Walgreens has announced they are stocking store shelves with CBD products for customers. Walgreens will start offering customers CBD sprays, creams, and patches in an estimated 1,500 stores across America. 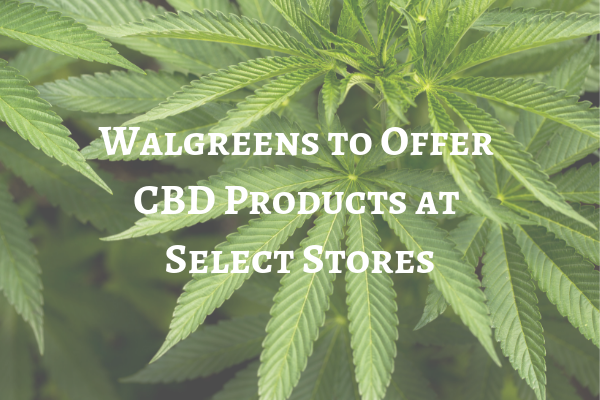 Customers in Indiana, Vermont, Illinois, Tennessee, South Carolina, Colorado, New Mexico, Kentucky, and Oregon will be able to get their CBD from their local Walgreens pharmacy. This move comes shortly after CVS released news that they were offering CBD products in an estimated 800 stores across eight states. Both Walgreens and CVS are showing that they are listening to the demands of the public. People are looking for quality CBD products but are very hesitant about buying them from local Bodega gas stations and stores filled with people they wouldn’t normally associate with. CBD isn’t just something that fits a particular age group as a trend. It has a diverse consumer base ranging from children, to young adults and senior citizens all the way to cats, dogs, horses, and more. In an email to CNBC, Walgreens spokesman Brian faith said, “this product offering is in line with our efforts to provide a wider range of accessible health and well-being products and services to best meet the needs and preferences of our customers.” The move of major pharmacy chains in the United States going into offering hemp derived CBD infused health, and well-being products is a smart one. Current FDA rulings create a cloud of confusion about adding CBD to food and beverages. Until the air is clear regarding the legalities of these issues, it’s a safe bet to bank on the growing consumer demand of CBD infused health and wellness products.